Corey Perlman is the President of eBoot Camp, Inc., an education company that provides people with the knowledge and skills to effectively market their business on the Web. Through interactive books, seminars and workshops, Corey quickly transforms business owners, entrepreneurs and company employees into Internet marketing “propeller-heads!” Since 2005, Corey has conducted over 200 eBoot Camp workshops and seminars to public audiences as well as small and mid size companies all over the United States. With a layman’s terms and learn-by-doing approach, these workshops and seminars have earned an overall exceeded expectations rating of over 90%. 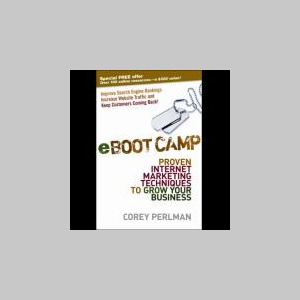 Corey's book, eBoot Camp: Proven Internet Marketing Techniques to Grow Your Business, hit #1 on the Amazon.com bestseller’s list in the marketing, retail and ecommerce categories. The book is currently available wherever books are sold.